Windham resident, Raymond Philpot, has an unusual hobby; he studies the history of snowplows, and re-creates them in miniature. “There’s more to (snowplows) than meets the eye. The way they’re designed, all the moving parts, the physics (behind) moving snow. Over the years, snow fighters worked with what they had.” explained Philpot. Utilizing 22-gauge sheet metal; hobby wood; strips of vinyl; micro nuts and bolts; brazing rod wire; jewelry chain and parts of old, discarded toy trucks, Philpot fabricates working models of old-time snow fighting equipment, including V-shaped wooden draggers, snow rollers and 1920s and ‘30s vintage tractors. As seen in the accompanying photo, the wooden V-plow (A) from the 1800s was horse drawn and used to clear one lane along a road way. “The operator would then turn his rig around and, using only one side of the V-plow, clear the other lane. And it could clear a parking lot (sized yard) by operating in circles.” said Philpot. 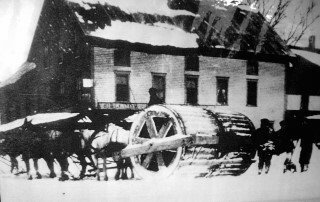 The snow roller (B), is a giant, wide wheel used in Windham into the 20th century. The horse drawn implement would pack snow to accommodate sleighs and wagons equipped with skis or runners. The snow roller had a rear-mounted scraper to clear the snow and ice that would stick to its wooden planks. Often, boxes filled with rocks were fixed to the back of the roller for added packing power. In most towns, including Windham, the municipality owned the roller; farmers with teams of horses were hired to roll the streets. Philpot said his research turned up humorous stories about Windham’s roller operators. It seems the farmers were paid both money and grog for their services. Grog, a diluted rum beverage, was said to “warm the body” of those working in cold weather. The story goes that operators would frequently imbibe heavily and pass out in the snow roller seat. The horses, familiar with the route, would finish the job. “More than one “old-timer” in Windham told me that story,” said Philpot. In an article written many years ago, the late Ken Cole, Jr. described snow removal in Windham in the 1930s. “A bull dozer (C) would be put into a (plow) frame.” In the days before hydraulics, a three-man crew consisted of a driver and two ‘wing men.’ In order to raise and lower the front V-plow, the big rig had to be stopped. Operators would make the adjustment by hand, utilizing the built-in ‘pry bar extensions’ that ran the length of the tractor. Cole reported “It was a slow, hard task. And it would not begin until the storm was over. The great plow could be heard a mile away, “venturing forth at a top speed of six to eight miles an hour.” Farm families along the way would provide hot drinks and snacks to the operators. Soon, Philpot’s working models will be on display at the Windham Historical Society’s museum on Windham Center Road.